Hundreds of thousands of refugees from the conflict in Somalia are being forced to live in woeful conditions, the aid agency Oxfam says. 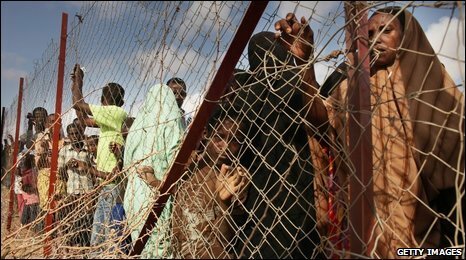 It says overcrowded and badly managed refugee camps in Somalia, Ethiopia and Kenya are "barely fit for humans". Dadaab camp in north-eastern Kenya was meant to hold 90,000 refugees, but is now home to almost 300,000 people, and a further 8,000 arrive each month. Oxfam has called on Kenya's government to urgently allocate more land. 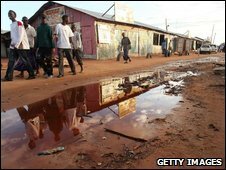 "We really need extra land, extra space, to be able to spread people out," Oxfam's Paul Smith Lomas told the BBC. "And that land needs to be allocated soon. We've had assurances for months and months now. Now we need action." Kenya's commissioner for refugees, Peter Kusimba, told the BBC that the pace may have been slow, but land was being earmarked to decongest the camp. As fighting continues in Somalia many are unable to flee the country. Afgooye, near the capital Mogadishu, is home to almost half a million Somalis and is the world's densest concentration of displaced people, the BBC's Will Ross reports from Nairobi. Insecurity makes it increasingly difficult for local and international agencies to deliver aid there, he adds. Oxfam has described the situation as a "human tragedy of unthinkable proportions" and says the international response has been "shamefully inadequate". "The ultimate solution to the situation and the needs in Somalia has to be peace, has to be a politically negotiated peace settlement," Mr Smith Lomas said. "Much is being done, and much more must be done. Until people experience safety and peace on the ground, then we will have to continue responding to these humanitarian needs," he added. The European Commission, which provides funding for the Dadaab camp as well as other projects inside Somalia, insisted the international community is not ignoring the problem. Spokesman Daniel Dickinson said the commission had spent 4m euros on food provisions and 3m euros on overhauling the water supply in Dadaab this year - with millions more earmarked for next year. Somalia is nominally ruled by a UN-backed government, but Islamist insurgents control large areas. The failed Horn of Africa state has not had a functioning central government since 1991.